A Healthy Home and Minimalism! What does being a minimalist entail? It’s not selling everything you own, but more of ridding the excess to gain a different perspective on life. A minimalist: A person who owns little. Many claim that being a minimalist can help you live more in the moment, experience real freedom and help you discover purpose. However it can also teach us the value of our belongings, our time and the art of simplicity, by choosing to live a life with few possessions and simple materials. We believe in being practical, enjoying what you own, having a connection with the things you love and combining minimalism with a healthier lifestyle. We encourage you to own less, create new habits, which will create more time for your passions. Do you feel you have clutter in your home? Would you like to do more for the environment? Do you want to live in a non-toxic environment? 1. Spring cleaning: clean out all of your unnecessary junk, unworn clothes, and other miscellaneous objects. Donate, sell, and or recycle! Remember, the less you own, the more you are able to focus on other important aspects of your life. 2. Replacing or purchasing an item? Buy eco-friendly, sustainable, organic, toxic-free products, whether it is a mattress, bed linens, furniture, flooring, or just simply painting a room. 3. When purchasing new products, ask yourself, do I really need this? How does it add value to my life? 4. Purchase items that are well made and don’t have to be replaced over and over again. 5. Refuse to bring products into your home that have been manufactured with cancer causing chemicals like formaldehyde, vinyl chloride and benzene. There’s nothing wrong with owning material things, but by limiting ourselves, we are able to discover the world beyond our possessions and find that same satisfaction through living a purpose-driven life. Give these healthy minimalism tips a try and let us know what you think! Recently I was informed that chemicals do not contaminate cotton, because the boll (the seed pod of the cotton plant) is closed when spraying occurs. 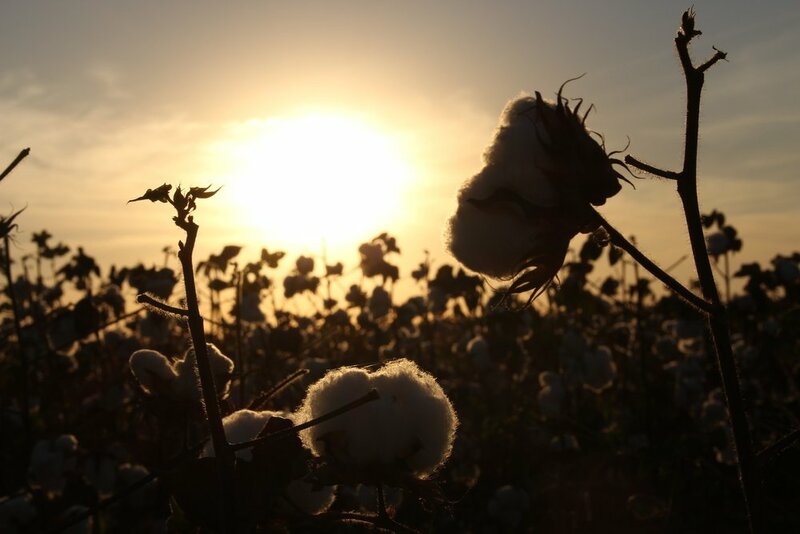 Before we share anything with our readers, we like to get all our facts straight, so we went straight to the source and spoke with Kelly Pepper, who has been involved in cotton farming since the ‘80s and the manager of Texas Organic Marketing Cooperative. His response? It depends on the time of the year and the situation. There are two types of cotton harvesting: mechanical and hand-picked. The USA, Brazil, and Argentina are some of the countries that use mechanical harvesting, while cotton is picked by hand in most developing countries. For mechanical harvesting, the plant is commercially defoliated by spraying the plant with herbicides, which causes the leaves to drop so the plant can be harvested without the leaves. If the leaves are not dried out, the green leaf of the boll can stain or be swiped up into the cotton gathering process, causing the cotton to be stained. The chemical defoliation application is made after a majority of the bolls are open which exposes the fiber to the chemical. In Texas, cotton is usually ready for harvesting in mid-October. The organic farmers will wait until a freeze around mid-November, which naturally causes the plant to drops its leaves. Cotton that is picked by hand is less likely to be sprayed, but there’s still a possibility. When a plant grows, the lower branches will produce the boll first. As the plant continues to grow, the top of the plants may need to be sprayed with pesticides. Plants can still be sprayed for insects when the lower bolls are open and ready to be hand-picked. This means insecticides would be sprayed on the plant, landing on the open boll and contaminating the cotton. What would you like to learn more about in our next Facts Behind the Fiber? How Safe is Your Scent? A fellow survivor recently told us that when she spilled an air freshener in her home, it damaged the finish on her tile floor. Another person chimed in and explained that her husband's car air freshener leaked and damaged his dashboard. What’s in air fresheners that’s so powerful that they can create this type of damage you ask? CHEMICALS. If the chemicals in these products are so strong that they can ruin dashboards and floor finishes, what are they doing to our health and the health of our children and pets? We shouldn't have them in our homes and around those we love. The Environmentally Protection Agency states that the air in our homes is 2 to 5 times (sometimes 100 times) more toxic than the great outdoor air! Fragrance is so much more than a scent. When I get a waft of perfume, fabric softener, or hand sanitizer, my body reacts right away. I also can't stay in a room that has burning scented candles, since I'll become nauseous and get headaches. Once I realized the harmful effects, I switched to all natural products. Turns out, I never get headaches from non-manufactured products! People misunderstand the concept of fragrance. Fragrances should be created from nature and natural products; not from perfume, fabric softener, and laundry detergents. The world is gifted with amazing natural aromas from flowers, essential oils, natural potpourri, citrus, and herbs! Stay tuned for our next blog about essential oils. They're not only healthier and safer, they're also therapeutic! Your two legged and four-legged family members will thank you. Laverne Williams is a healthy living visionary and has been a Texas pioneer of energy efficient home design since 1975. Williams is recognized for his diligence and dedicated efforts for conserving our environment and health while significantly lowering the cost of living for his clients. He's one of the nation’s top green building professionals and has been awarded The Texas Legacy Project, Egret Award, and Houston Hero for the Environment. Williams has always been an avid lover of nature, and even confessed in our interview that his CB Radio handle in high school was “Nature Lover”. But it wasn't until he began having health issues that he combined it with his degree in architecture. Feeling unsatisfied with the work he was conducting, he took a six-month sabbatical to reflect on to modify his work to something he was passionate about without damaging his health. He then decided to create an environmentally oriented architectural practice, Environment Associates. This was the first architectural practice dedicated exclusively to “eco-architecture” in the state of Texas. Quickly after its inceptions, clients began to contact Williams due to their own deteriorating health from substances that are prevalent in home design. EA has been providing customers with high performance green homes ever since. Environment Associates mission is to improve quality of life on Earth through conscious indoor and outdoor design by using innovations such as solar power, net zero energy, net zero water, and organic landscaping among various other forms of sustainable technologies and designs. Williams explained that the first step in creating a sustainable and healthful home is the selection of the property. The functioning of a home can be optimized based on its orientation, which varies by location and climate, but performs best with southern exposure. It's also pertinent to have a garden, which confirms that food is clean and healthy. We also discussed the current imbalance held on Earth, and how it was brought upon by man’s ignorance regarding the necessity for ecological balance. “This is when health problems arise for individuals and the planet. If we are going to have a healthy world we need to stop creating toxic waste while cleaning up the toxins we have already emit into the environment. The first step in doing so is creating an environmentally conscious home,” he explained. EA's project Houston Integral Urban Homeplace in the Heights demonstrates these principles and the interconnections between the land, the neighborhood, the larger city, and the planet as a whole. From his work with the Sustainable Building Coalition to the Austin Green Building Program, LaVerne Williams' work has played an instrumental role in growing the green building movement. Last week we talked about a beautiful five-star green home owned by Tom Kolnowski, Founder of Digitized House Magazine. So, this week I wanted to share information and tips about the water, electric and geothermal systems installed in the home from Kolnowski himself. Tom: The home is located in drought-prone Central Texas Hill Country region, where a 30,000-gallon rainwater system is its only source of water. It has proven to be a rock-solid solution, never dropping below 70% of its capacity over the 3 years it has been in place. He says that a rainwater harvesting system should be near the top of your checklist when you are contemplating the build or purchase of a high-performance, sustainable, and environmentally-responsible home. Ideally, the collection system, rainwater storage tank, and filtration setup should be designed and sized to supply 100% of your water needs both inside and outside of the home. Tom: This dwelling, that we also use as the Zero Net Energy Living Lab house, was designed from the ground up to be nearly all-electric, with the intention to offset the bulk of that electrical usage with rooftop-mounted solar photovoltaics. The only exception to that was in the kitchen, where the cooktop was fueled by propane, as the gourmet-chef-in-residence was not willing to live with one of the new induction cooktops or a more conventional electric cooktop. Everything else was designed to be 100% electrically-powered, including the remainder of the major appliances and all mechanical systems: aerobic waste treatment, rainwater harvesting, potable water treatment, water heating and recirculation systems. And, of course, the HVAC and fresh-air intake system. Tom: We installed a single ClimateMaster Tranquility ground-source geothermal heat pump system to meet all cooling and heating needs, which is enabled through the drilling of four 300-foot deep geothermal wells on the property. This HVAC installation is controlled by three second-generation Nest smart thermostats—which are programmable, self-learning, sensor-driven, and Wi-Fi-enabled. How well does this setup work with the Nests? Splendidly. When living in a near-zero net energy (ZNE) house, one must be ever-vigilant about energy consumption. The Nests go a long way toward minimizing kilowatts consumed for cooling, heating, and circulating fresh air. For example, the Auto-Away feature, where the Nests automatically set themselves back when they sense the house is unoccupied, is a notable energy saver. And the now-standard ability to remotely adjust the Nests anytime through a smartphone app, is much appreciated - particularly on those days when life throws you a curve. And on those 100℉+ Texas summer days where cooling is king, the super-efficient geothermal system and the Nests do their part to deliver admirably on energy-saving goals. Digitized House Magazine is an online source for homeowners who are interested in smart, sustainable, and zero-energy efficient homes. Recently I had the opportunity to visit Tom and Peggy Kolnowski at their five-star green home in Driftwood, Texas. Tom is the Founder of Digitized House Magazine, so I knew I would be in for a treat. The peacefulness and calmness of their home captivated me from the moment I saw it. Everything was in harmony and – more importantly – everything was built to maximize sustainable practices and minimize destruction of valuable resources. And it is just beautiful. The house capitalizes on natural light and was built to minimize harmful effects on human health and the environment, safeguarding air, water and the earth. Tom and Peggy built their home using optimal location on the land, overlooking stunning Texas vineyards that transport you to Tuscany – and they did it all without removing a single oak or cedar tree from their property. Both the open and screened-in verandas are a perfect place for starting or ending your day, whether that’s relaxing with a beverage, reading, entertaining, dining or watching the sun set in that famous Texas sky. The flow throughout the home, the use of space and the ventilation systems were all designed for efficient heating and cooling. A 30,000-gallon rain harvesting tank that holds the equivalent to 1750 average showers was installed and, within two months, was filled with rain-water in our drought ridden climate. To this day, it has never dropped below 70% of its capacity in the 3 years it has been in place. The Kolnowskis set out to create a safe, sustainable five-star green home, and that’s exactly what they did. To reduce electricity, they installed energy-efficient lighting and appliances. To lower water consumption, they installed water-saving plumbing fixtures. And, to eliminate the emission of volatile organic compounds, they built their home with non-toxic materials. The end result is a home that uses very little energy, conserves water and is free of toxic off-gassing. In my next post, I’ll go into more detail about the rain harvesting system, solar panels and geothermal features. Stay tuned! I organized a home tour so those interested in learning about green products and professionals could hear first-hand from a homeowner on the benefits of building one for yourself. It was a fabulous afternoon spent with a great group of people that are passionate about learning more about what it means to live in a sustainable, non-toxic world. We saw first-hand how rainwater can be captured and used onsite. And the homemade orange-infused Texas rainwater prepared by Peggy Kolnowski for the tour was simply delicious! It prepped us for the enticing questions and answers that lay ahead. We sipped and listened while Tom Kolnowski educated us on the green sustainable features in their home. He covered everything from the paint to the minute details of the inner workings of their heating and cooling system. One thing I particularly loved, though, was Tom's demonstration of their Integrated Vacuum system, which helped everyone understand how best to keep dust out of their home. He explained that, in their last home, when Peggy would start to vacuum he immediately had to reach for his inhaler and leave the house. He wasn't being overly sensitive - as it turned out, the micro dust was sneaking through the HEPA filter. This year has brought about some pretty nerve-wracking revelations regarding air pollution. For instance, the Global Burden of Disease project estimated that - on an annual basis - over 5.5 million people are dying prematurely from illnesses associated with increased levels of air pollution. The Environmental Protection Agency (EPA) has stated that Americans spend between 80-90% of our time indoors and that indoor air pollution can potentially be more harmful than ambient air pollution. The EPA has even named indoor air pollution as one of the greatest public health risks! The easiest and most inexpensive way to improve indoor air quality is to simply open your windows. Just a few minutes of fresh air can reduce the accumulation of damaging pollutants which - left undisturbed - can stagnate inside of a home. Just be mindful of the allergy count in the area you live in. Some regions have seasons that are more likely to activate your allergies and cause more irritation for your health. Beautiful and cleansing, indoor houseplants are not only great for brightening up your home but are also powerful detoxifiers of various air pollutants. The American Society for Horticultural Science reported that plant species such as snake plants, spider plants and golden pothos are most effective in reducing pollutants such as ozone. Add a few to your home decor and you'll obtain a spa-like botanical aesthetic while cleaning the air from within! Essential oils smell great while inducing a sedative effect that can increase positive feelings. As if that doesn't sound great enough, these oils are also proven to clear your mind AND harmful toxins from the air. How? Essential oils have antibiotic and anti-carcinogenic properties which can significantly inhibit the growth of airborne bacteria. So, when diffused throughout your home, they are actively working toward cleaner indoor air. Salt lamps are made from Himalayan salt crystals and work as a powerful air purifier. When the lamp is lit it emits negative ions that bind to positively charged toxins while helping to remove them from the air. Additionally, they have been shown to naturally remove allergens such as smoke, pet dander, pollens and other air pollutants - all while radiating an amber glow that is beautiful and relaxing! 1. Keep a mat inside and outside of your door for wiping your feet. 2. Remove your shoes when entering your home so you don’t track chemicals and allergens in. 3. Do not use toxic air fresheners in your home, instead invest in an essential oil diffuser. 4. Do not use dryer sheets, instead use dryer balls. 5. Use non-toxic cleaning products in your home. 6. Open your windows and let the fresh air in (when pollen count is low). 7. Check out NASA’s clean air study and recommended houseplants. 8. Use organic sheets and blankets We spend about 1/3 of our lives sleeping. 9. Purchase organic mattress topper and pillows. 10. Invest in an organic mattress. 11. Paint or stain with no or low VOC sustainable, eco-friendly, non-toxic, paints and stains. 12. Purchase curtain fabrics and window treatments that have no toxic chemicals added. 13. Remove carpeting, it hides chemicals and is a breeding ground for dust mites. 14. Use eco-friendly flooring like ceramic tile, cork or wood that has not been treated with a toxic finish. 15. Purchase an area rug that has no chemicals or toxic dyes and that can be easily cleaned. 16. Buy solid wood furniture that has been finished with non VOC products. 17. Hire a landscaper who does not spray chemicals. 18. Plant the correct plants for your area and climate. 19. Purchase products from a reputable retail store like TreeHouse who research all their products. 20. Check out the Green Professionals on Green For A Reason for bigger jobs like building or remodeling.